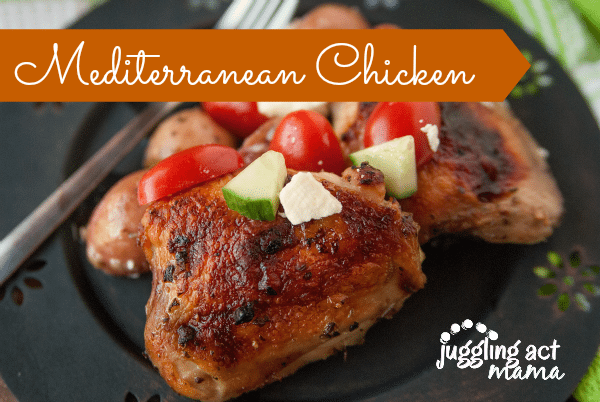 Get dinner on the table in no time and with only one pan when you serve this Mediterranean Sheet Pan Chicken Dinner! 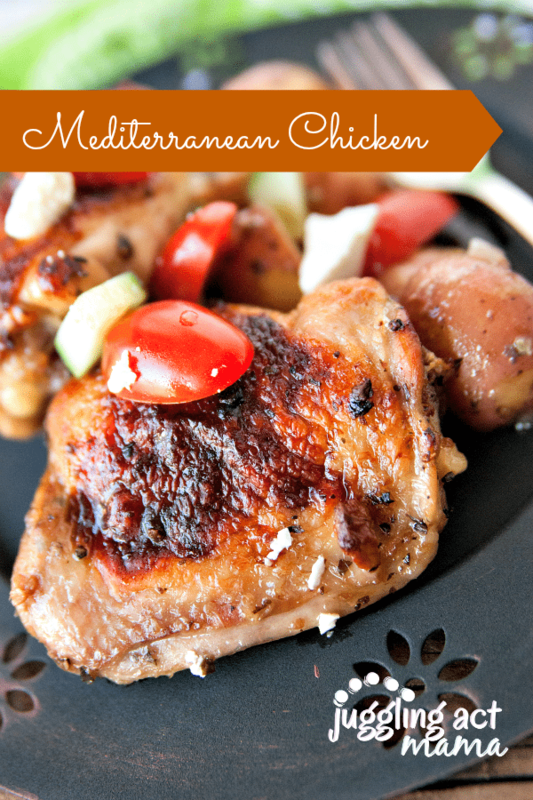 I love a good one pan dish and with school back in session and after-school activities starting to add up, dinner often has to be no muss and no fuss, which is why this Mediterranean Sheet Pan Chicken Thighs meal is perfect for those crazy busy nights. 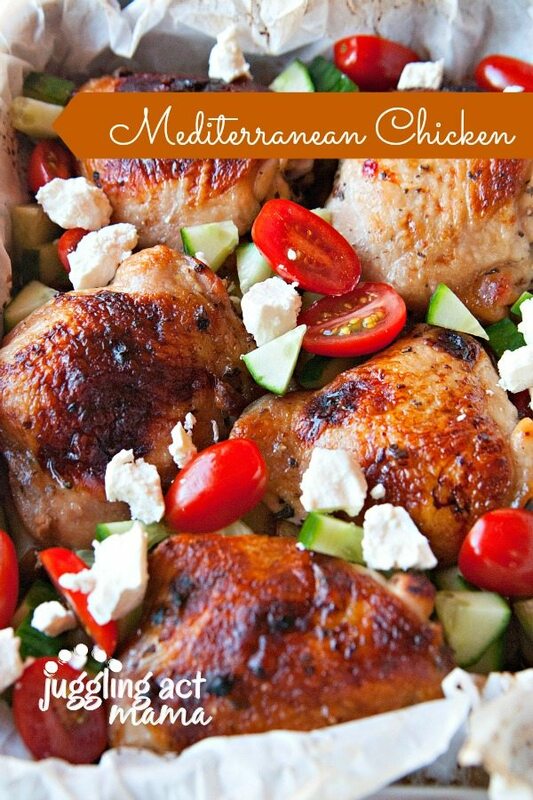 I know that Greek food may sound difficult, but these chicken thighs are really easy to make and even better to eat. It needs to marinate a bit though, so make sure you prep the night before. This is one of those meals you could definitely prep and store in a freezer bag in the freezer (just leave out the cheese and potatoes until you plan to cook and serve). The longer it marinates, the deeper the flavor will be. Mediterranean spices come from countries that all border the Mediterranean Sea. This includes the countries of Italy, Greece, Turkey, and Spain, among others. There are only a handful of ingredients in this easy family dinner. You can make life super simple by using bottled Greek dressing. Of course, if you want to make your own dressing that’s always an option too. I prefer to let the chicken marinate overnight, but you can let it marinate for a few hours. Either way, you will discover that marinating a chicken will leave the thighs super juicy as they cook. They only take about 30 minutes to cook! Is your chicken marinated? 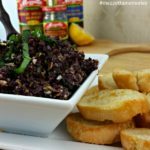 Get ready for a super quick meal that your kids and family will all adore! In a large freezer bag, add the chicken thighs and one cup of the Greek dressing. Allow to marinate 12 – 24 hours. Line the bottom of the dish with potatoes and add the marinade from the bag the chicken was in. Bake for approximately 30 minutes or until the chicken is golden brown and no red juices run from them. You can also check with a thermometer, and it should reach 165–175°F. When cooked, remove from oven and let cool for 10 minutes. Sprinkle the tomato halves, cucumber and feta cheese on top. Enjoy! This is one of those recipes that both the kids and the adults can agree on and honestly, it would be perfect for couples too! 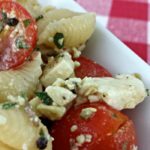 One pan of Mediterranean Chicken would be perfect for a nice dinner at home and plenty of leftovers for lunches and dinners the rest of the week. Mediterranean Chickpea Salad – Recipe Girl – This simple salad is full of protein and vitamins from the chickpeas, feta cheese, and olives. One Pot Mediterranean Turkey Sausage and Rice – Bowl of Delicious – This vibrant meal only takes 30 minutes to make and is packed with veggies. Mediterranean Chicken and Spinach Casserole – Joy Filled Eats – This is such a delicious way to sneak iron-rich spinach into your family’s next meal. I love anything that means less dishes – and this looks amazing! Thanks for the recipe, pinning! My wife makes something like this and it’s really good.